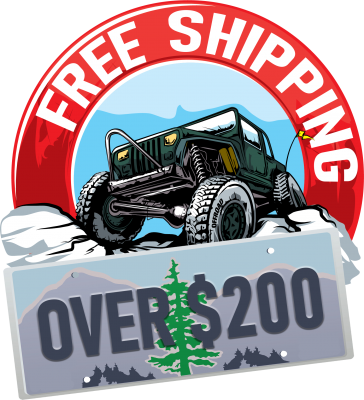 The use of all products sold by DIY Offroad Products are at the purchaser’s own risk and liability. All products are intended for off road use only, and are not approved by DOT. DIY Offroad Products and G&G Custom Metal Fab LLC shall not be held liable for any damages, personal, property, or other, resulting from the use of these products. Use and installation are the sole responsibility of the purchaser and/or the end user. Proper welding and fabrication procedures must be followed by a qualified installer when installing any product manufactured or sold by DIY Offroad Products. Improper installation can cause a lower level of safety and performance. Purchaser assumes all responsibility and liability for installation. DIY Offroad Products cannot be held responsible for improper installation, or modifications or use of our products. DIY Off Road Products is protecting your personal information including, but not limited to your name, address, telephone, email, and credit card numbers. With respect to your privacy, we will not sell, lend, or distribute your personally identifiable information to anyone at any time. Your personal information will only be used to process your order(s) via our secure online store, in person, or by telephone. Throughout the checkout process in our online store, your payment and personal information is always kept secure. Before fabrication and/or installation, please verify the ordered items are correct and that all applicable parts are present. If you are unhappy with any product or have a problem with it, please contact us immediately. Refunds or exchanges are available within 30 days of purchase. No refunds for shipping charges. No reimbursement for return shipment of product back to us. Products that have been installed are considered “used” and are not returnable or exchangeable. We reserve the right to ship via UPS, FedEx, USPS or any other method we see appropriate. Transit time will be maintained. Packages are usually left at the front door if nobody is there to receive them. Allow 15 days for shipping generally. In stock items usually ship within one business day. Multiple packages may arrive on different days. Please inspect your order for damage and completeness before disassembly of your vehicle. Please contact Customer Service should you need any assistance with your order before your installation. Estimated shipping dates are subject to change at any time. Please call us with any questions. Smartpost: Typically 2-12 days transit time from original ship date depending on your location. Use this economy method on lighter items (9 lbs and lighter) when you don’t need the part in a hurry. Shipping options are only available for USA and Canada at this time. Shipping charges are calculated on our website based on weight and dimensions to your ZIP code. Shipping costs will be deducted from the refund of any order returned that was originally purchased using a shipping discount or free shipping promotion. DIY Off Road Products reserves the right to cancel orders made on products that were incorrectly priced on this online store. Should this happen, We will notify you of the incorrect pricing and give you the option to keep the order at the correct price or cancel the order.